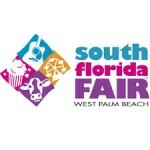 The South Florida Fair attracts more than a million visitors each January, but there are plenty of other events at the South Florida Fairgrounds all year long. As the season nears, the activities start building. For instance, here is a sampling of the events in October alone: West Palm Beach Antiques Festival Since starting 20 years ago, this has become the largest monthly antiques show in Florida. Vendors offer a wide variety of antiques, collectibles and vintage items. October 3-5. (noon-4:30pm) www.wpbaf.com Ghost Tours: An Evening in the Dark Over the years, there have been ghost sightings and mysterious cloaked figures seen lurking in the old Florida homes at Yesteryear Village. But is the village really haunted? See for yourself on October 3 (8pm-10pm). Bucklerâs Craft Fair A staple for more than 25 years, Buckler Craft Fair presents award-winning crafters from around the county. You will find everything from handmade jewelry to one-of-a-kind clocks to country decor. October 18-19 (10am-4pm) West Palm Beach Fall Home Show Discover the latest home trends at this spectacular show, where exhibiters present the most advanced products for every room in the house. You canât help but be inspired after browsing from booth to booth. October 24-26. www.WestPalmBeachHomeShow.com The South Florida Fairgrounds is located at 9067 Southern Boulevard, West Palm Beach.